Check out this beautiful used 57' Nordhavn yacht for sale! : Atlantic Yacht & Ship, Inc.
Word just came in from Gregg Silver that he has listed a great deal on a beautiful used 57′ Nordhavn! In the first place, this lovely used 57′ Nordhavn is located in the charming Florida Keys. In brief, one should take advantage of this opportunity to own this pampered one-owner vessel. Equally, this yacht has been pampered and treated like a member of the family with no expense spared! After all, this yacht went the extra mile as one of the most tank tested displacement yachts to ever bare the Nordhavn name. Similarly, the bulbous bow and custom hull strakes make this one of the fastest, most efficient passage-makers ever devised! The owners of this used 57′ Nordhavn worked with the factory to make this ship truly unique. Not to mention the enlarged master stateroom versus the standard layout stateroom. Additionally, this yacht has an enlarged galley window and numerous custom storage features. Other highlights include hydraulic bow & stern thrusters, hydraulic windlass, TRAC stabilizers, diver compressor, water-maker and more! 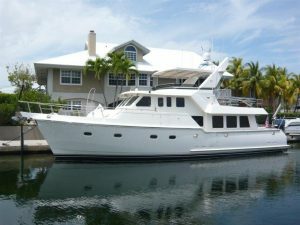 For more information on this beautiful used 57′ Nordhavn yacht in Florida be sure to contact Gregg Silver today!